Democratic Gov. 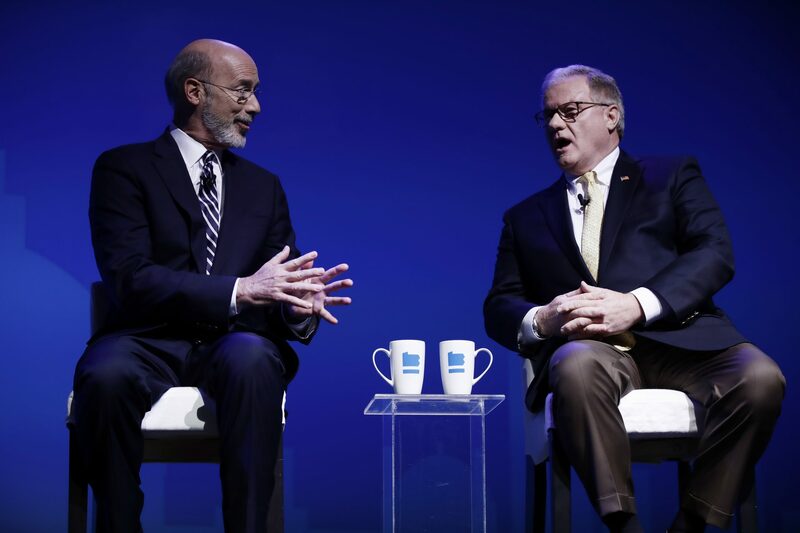 Tom Wolf, left, and Republican Scott Wagner take part in a gubernatorial debate in Hershey , Pa., Monday, Oct. 1, 2018. The debate is hosted by the Pennsylvania Chamber of Business and Industry. PA Post reporters will be annotating key moments from the Monday night debate between Democratic Gov. Tom Wolf and Republican Scott Wagner. 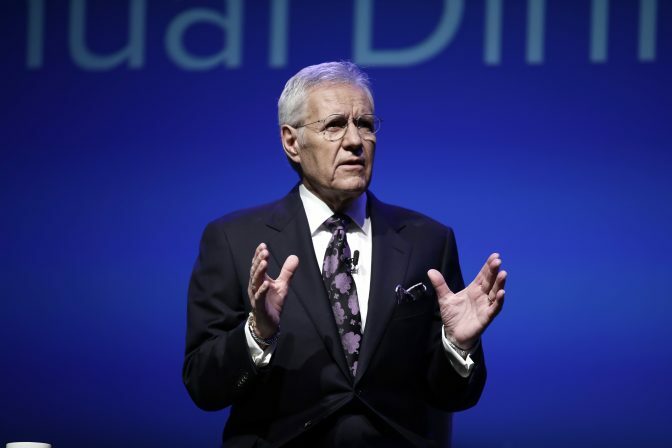 Alex Trebek, the host of the game show “Jeopardy!”, moderated the debate. To see the notes, click on the yellow areas. Trebek: All right. And the second point for you, Mr. Wagner, that I wanted to bring up: you and the governor disagree on capital punishment. He imposed a moratorium on the death penalty, on executions in Pennsylvania, and executions haven’t taken, taken place here I believe in 20 years. You are in favor of the death penalty and in fact you went even further this year, did you not? Wagner: I did. And I know the first person I’ll sign the death warrant. This man killed his brother and killed three innocent women, one in your county. He doesn’t deserve to live. He’s been sitting on death row for 20 years. There was a, there was an assassin. His name is Eric Frein. He assassinated a state trooper in Pike County in September of 2014. He will sit on death row for many, many years. He assassinated a trooper just like he would shoot a groundhog. And he talked about the satisfaction that he got out of taking that trooper’s life. And then he wounded another trooper. This man is going to allow that person to stay on death row, and the family, the wife of that slain trooper and their two sons will never see justice. Trebek: But when I say you went further, you were calling for a mandatory death penalty for people who kill students or adults on school property. Wagner: Absolutely. I’m going to stand up for innocent people. To think that teachers and students can be in a school and be executed and killed senselessly—no. You need somebody who is going to stand up. Wagner: This has been going on for—listen, we’ve seen, we’ve seen many incidents. Trebek: All right. But six months before Parkland, less than 200 miles away, a man walked into a gay nightclub in Orlando and killed 49 people. Six months after Parkland another lunatic in Las Vegas shot up an outdoor concert, killed 58 people. Trebek: Yeah, but you didn’t call for that at the time. You said—you restricted it to school shootings. Now, justice has to be applied equally, so that’s one of my concerns. The other concern—I’m not an attorney, but I know that in 1976, in the Supreme Court Woodsen v North Carolina, the Supreme Court declared mandatory death sentences to be illegal. They left a little loophole in there for murders that are committed by inmates in prisons, but they closed that in 1987. So that’s set law, isn’t it? You have mentioned that you’re going to put forward legislation to change all of that. It’s not going to go anywhere, is it? Wolf: Let me just point out that I think the people who created—who committed those crimes should rot in prison and be punished severely. There is a, there was a Senate bipartisan commission looking at what we should do with the death penalty. And their recommendation was that Pennsylvania should continue with the moratorium. So, I’m continuing to do what that bipartisan commission said we ought to do. Punishment is absolutely essential and called for for the crimes that were committed there, and I think these people should rot in prison. Trebek: Education, I’m sure you both agree that the education we provide today is the economy of tomorrow and an educated society is a more prosperous society. You have less crime, less poverty, better health care. So let’s talk about that. The largest share of state spending is for education. Now, Mr. Wagner, I’m going to put you on the defensive for a few moments. In 2015, you said the state spends enough on public schools. You can lay off 10 percent of the teachers and they won’t be missed. Then you took a reporter on a helicopter flight over York County to show how well some of the schools were doing. They had pools. They had tennis courts, modern buildings. Then you criticized Governor Wolf, saying he wanted to raise taxes so he could put a billion dollars more into public education. You said, we don’t need it. The problem is mismanagement of school funds by the Wolf government. Then you said the problem was that most of the funding was being used for pensions and not making its way into the classrooms. Then you revealed your education plan and that called for an injection of a billion dollars into education without raising taxes. Now it seems to me that you have done a full 180. You started by saying they don’t need any extra money. And now I’m going to put a billion dollars into education. Wagner: Here’s a fact. Yes. Here’s a fact. The governor did not put any money in education in the first three years of his administration, because he didn’t sign a budget. The Legislature did that. Only this year, did the governor put money in education. If you don’t sign a budget, the money’s not going there. But here’s a fact. Approximately $2 billion went into the education system in the last four years. The Philadelphia Inquirer did a story probably in the last month that $1.3 billion of that ($2 billion) went to pensions. We have a pension crisis. We could have solved that pension crisis. First year in office, the House and Senate sent a comprehensive pension bill to the governor and he vetoed it. Because his, the government employee unions didn’t want the changes. Trebek: But hasn’t he made some pension reforms which you have voted against? Wagner: Listen at the end of the day and I don’t want to offend my colleagues. It doesn’t do anything. It’s just. What are we talking like $20 million or whatever. Ask people in the financial world. It didn’t do any heavy lifting. We need to go into a 401k program for new hires after a specific date. We have a $70 billion pension crisis. Trebek: You can’t. You can’t get rid of that unfunded pension overnight. It’s going to take time. And we overpaid money managers, according to the treasurer, $5-and-a-half billion over the last 10 years. See nobody wants to do any heavy lifting. And that’s what we need to start doing. Wagner: This governor is not willing to do that. Wolf: There’s a lot of a lot of protesting here. Wolf: Actually there is a bipartisan effort to do something about management fees. I’m not sure you’ve been very supportive of that. We actually had a pension reform bill that both the Wall Street Journal editorial page and The Washington Post editorial page thought was really good. We do have an unfunded pension liability issue and we’ve got to do something about that. But we are here in Pennsylvania doing something that most states are not and that is addressing the pension issue in a bipartisan way. Trebek: Well, it’s been my experience that almost every state in America has an unfunded pension liability problem.But let’s talk about education. Wagner: Why don’t we just keep playing the violin for the next 10 years. Trebek: But it’s an obligation. Wagner: We need to do something now. Trebek: No, but it’s an obligation. And you have to recognize that and you have to satisfy that obligation. Wagner: Alex, I do recognize that and we have to solve this problem. Listen, I have, I had school teachers come to my office when I was in the Senate. Retired schoolteachers. Please don’t take our pensions away. The government sector unions, corrections officers, school teachers are all telling their members: Wagner gets elected, he’s going to take your pensions away. That’s not true. I’m just the cleanup guy. But I can tell you we can do better to accept 1.29 percent. Governor Wolf, and you didn’t do anything about it. You were in office in 2017. Trebek: OK. Let’s talk about your your education plan since that’s what we were going to discuss. You’re going to put a billion dollars into education. Show me the money. Where’s it coming from. Wagner: Well that’s interesting. I’m going to go to go to zero-based budgeting. We’re going to balance our checkbook in Harrisburg, something we haven’t done in 30 years. I presented a plan along with Representative Seth Grove to the governor in 2016. It was, it was a Taxpayer Caucus report and we presented potential savings between three and four billion dollars. We never heard from the governor’s staff. We never heard from the governor. We were just discounted as being like disruptors. You know what? We have to turn over every single rock in Harrisburg and we need to start finding money and there’s money out there. Democratic Gov. 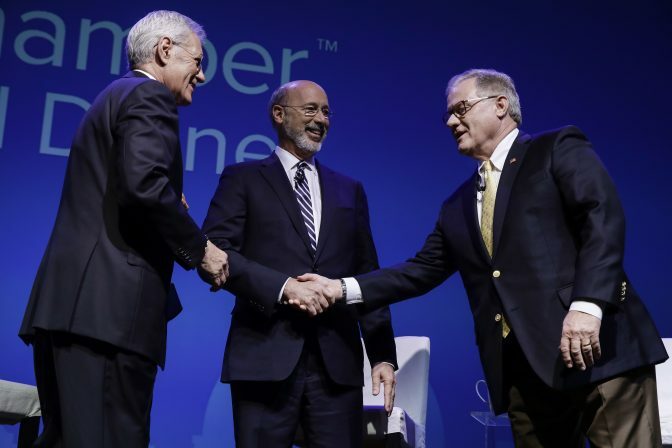 Tom Wolf, center, and Republican Scott Wagner, right, shake hands as moderator Alex Trebek looks on at a gubernatorial debate in Hershey, Pa., Monday, Oct. 1, 2018. The debate is hosted by the Pennsylvania Chamber of Business and Industry. Trebek: Well you have a structural deficit in this state. You guys balance the budget by drawing on one time elements. Wolf: That’s not actually. Actually that’s not true. We actually have a balanced budget. There was a one time, big one time deposit in our budget last year because we had a lot of onetime elements in that structural deficit. But we have a balanced budget at the end of last year, the end of the first quarter so far this year. I track the condition, the financial condition of the state on a daily basis. And we’re doing very well right now. Trebek: All right but with regard to education, Pennsylvania is not doing that well. I mean 37 percent of the state funds go to K through 12 education. Most states are 10 percent above that. Some states over 50 percent. Wolf: You’re talking about the proportion of the funding that goes into education. State versus local. Trebek: And for higher education, it’s even worse. Pennsylvania ranks what? Fourth from the bottom of the 50 states. You guys have been shortchanging education in this state for decades. The monies spent to educate the youth keeps going down and the expenses keep going up. Wolf: Let me, let me counter that. I mean, can we do more for education? Wolf: Absolutely. You’re right. That’s true. But are we doing more now than we were three years and eight months ago. The answer is yes. We have, I’ve put a billion dollars back into education. We have a ways to go but we are on the right track. So I think there are two things that we need to look at here. One is, you know, are we doing enough? Can we do more? And the answer, yes, we can do more. But are we doing more now than we were just a few years ago? And the answer to that is also yes. Trebek: Well, Mr. Wagner you mentioned a few moments ago that he, by not signing the budgets, didn’t put any money into education but you had proposed. Wolf: Actually I’m not sure what he’s ….The constitution, a bill becomes enacted both by being signed or not by being voted. Trebek: You just leave it alone and it becomes. Wolf: That’s right. That’ the way it works. Trebek: Now what you have not mentioned is that education in Pennsylvania suffered immensely about seven years ago when Governor Corbett knocked off a billion dollars and…. Wagner: Those were federal. Those were federal stimulus dollars. Governor Wolf went around and told that. It was an un-, it was a lie. Governor Corbett. …There was, and the stimulus money came in during Governor Rendell’s administration. And so Governor, you know Governor Corbett’s here tonight. And people need to know that Governor Corbett did as much for education as really any governor. And he needs to be, he needs to be remembered for that. He didn’t cut the billion dollars. It was a billion dollars of stimulus money that came in and we were, they were told, the education system — I wasn’t there — don’t hire teachers, don’t. They did all that. Guess what? Here’s the problem with the system, Alex. The billion dollars. It’s gone. We have nothing to show for it. We talk about the … and I appreciate your comments about the percentage of dollars. We have, we have, we had a swim coach at one of our state owned universities that just retired. Getting a pension of $15,000 a month. And he has paid up health care for the rest of his life. A great, great deal. Trebek: So there are some people who are abusing the system. Wagner: Well, there’s a lot of people. There’s a great story that just came out in the Philadelphia magazine about the DROP program, where there are council men and women in the city of Philadelphia that can resign their position two days before the election, enjoy a three to five hundred thousand dollar pension cash windfall and then get elected and get sworn in and be back in the system. Trebek: OK. We don’t have much time left. Wagner So corruption has a lot to do with funding not getting where it’s supposed to go. TrebeK: OK. We only have about a minute to go. Only enough time to talk about one tax that you have been proposing I believe for the past three years. And that is a severance tax on natural gas. Pennsylvania, the only major producing state that does not have a severance tax. Why haven’t you been able to get that tax put into effect? Wolf: We actually got it passed the Senate two years ago. And I’m not sure why it didn’t get passed the House. I will keep proposing it and I will keep looking for people to support it. We are the only major natural gas producing state in the United States without a severance tax. Texas, Louisiana, Alaska, Oklahoma – they all have one. We don’t. Trebek: All right. So the severance tax would bring in a lot of money. I. …No? No it would not? Who says no it would not? Trebek: You have the impact fee now which has brought in $1.2 billion due in the past seven years. And you’re telling me that a 6 percent severance tax would not bring in money. Trebek (to an audience member): You’re not part of the debate. These two are. Wolf: I’m not sure any. I don’t know who’s proposing a six percent severance tax. I’m not. The combination of severance and impact fee would actually be in line with what other states are charging on their severance tax and would bring hundreds of millions of dollars into Pennsylvania for schools, for roads and bridges. Things that we actually need to make our lives better. Trebek: Alright, before I get you two to make your closing statements, I would like to offer a suggestion to the people of Pennsylvania for this election. Forget that you’re Republicans or Democrats. Uh, we just had a few heated words about the severance tax. If you believe the severance tax would be beneficial, would bring in hundreds of millions of dollars that would help with education and other problems in the state, then call up the people who are running in your districts, ask them a question and say, are you in favor of the severance tax or against it? If they’re in favor, say all right, I’m going to vote for you. If they happen to be from your party, good. If from the other party, vote for them. If you’re against the severance tax, same deal. Call ’em up and say, are you for or against? If they’re against, vote for them. OK. Now. Wagner: Alex, Alex there’s something you have to understand. We have. We are the only state that has an impact fee. The governor doesn’t talk about that. So listen there was a deal done in 20- it was Act 13 of 2012. An impact fee was imposed. Trebek: The impact fee used to be 4.5 percent. It’s now down to 1.2 percent. As he mentioned, a few moments ago, you can combine the both, both of them, or you can impose. Wagner: Oh, no, no, no that’s not the deal. Trebek: Put a severance tax in. Wolf: No no, no, that’s, that’s not true. Wagner: Last year, the impact fee generated $217 million. …To ask, listen we’re taxing the gas companies. Do the people believe that we should tax, yes? But we already are. There’s an impact fee. Trebek: You’re not not taxing them that much because most of them are based in Texas or Oklahoma. Wagner: That’s a whole nother problem. Trebek: All right we’re out of time. We’re out of time. Some in the crowd booed. Trebek: What did I tell you guys at the beginning? No booing or hissing. Wolf (to Trebek): I think they were booing you. Trebek: And now you’re directing at me. Trebek: All right, governor, your closing remarks, please. Wolf: Again, Alex, thank you for moderating this. And I want to thank the Chamber for actually hosting this and organizing this event. And, Scott, thank you for running. I think in a democracy, again, we need two candidates at least to show the contrasts and the two different visions that we have for Pennsylvania. My vision is really simple, it is that if you start from where I started, three years and eight months ago, Pennsylvania was underfunding its schools. We need to a better job. I have put a billion dollars into our schools. 720,000 Pennsylvanians have health care who didn’t have health insurance just three and a half years ago. I have made Pennsylvania better in terms of focusing on the opioid epidemic. And I’ve done this in a fiscally responsible way. We have a balanced budget. We actually have put money into the rainy day fund for the first time in over a decade, and I’m doing it with integrity. These things matter for our democracy, for our commonwealth and for our future. And if I’m given the privilege of another four years, I will continue to move Pennsylvania on this path, on this trajectory to a better future. Thank you. Wagner: You know, we’ve had a great evening tonight. You know, the people here at the Hershey Lodge and Convention Center, the servers, did you notice how they served 1,700 meals flawlessly. Did you notice that? Why am I telling you this? Because the kitchen’s working here. But it’s not working in Harrisburg. OK.
And if you think I’m kidding. Listen, I’m an operations guy. I know what it takes to put hundreds of trucks on the street every day. I know what it takes to have men and women leave when it’s dark out. 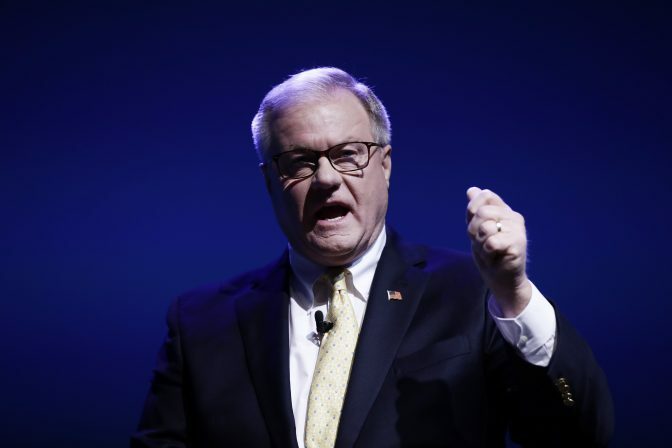 Republican Scott Wagner during a gubernatorial debate with Democratic Gov. Tom Wolf in Hershey , Pa., Monday, Oct. 1, 2018. The debate is hosted by the Pennsylvania Chamber of Business and Industry. Our agencies in Harrisburg are not working. If I was going to write a book or produce a movie, it would be “Government Gone Wild.” Do you know what DEP stands for? Don’t Expect Permits. That’s what it stands for. Listen. We can talk about gas taxes in Pennsylvania. We do have the highest gas tax in the nation. And you know what, I’m OK with that. But you know what, we shouldn’t have more potholes than ever in the last four years. There’s more trash along the highways. There’s more bent up guide rails. Listen, if you do what I’ve been doing for the last year, over 600 stops, talking to people in truck stops, and in diners, manufacturing plants, coal mines, natural gas drill sites. Go up to Elk County, to the beautiful Elk Visitors Center. Visit the Lumberman’s Museum. Go around Pennsylvania and talk to the people of Pennsylvania, they have a completely different opinion of Gov. Wolf. Things aren’t working. And it’s about time it changes. Listen, folks, I’m not trying to be politically correct. And I don’t need this job, and I don’t need the money. I have a great career. But I want to tell you something. I’ve met some of the greatest people in Pennsylvania, as I’ve travelled around. Farmers, for example, all, they need someone who’s going to fight for them. And I pledge to the people of Pennsylvania, if you elect me as the next governor, I will get more done in the first six months than you’ve seen in the last 12 years. Because I have one other pledge. Trebek: (Inaudible) Gotta wrap it up (inaudible). I have the stage, he’s not taking it away from me. Here’s my closing. Listen. 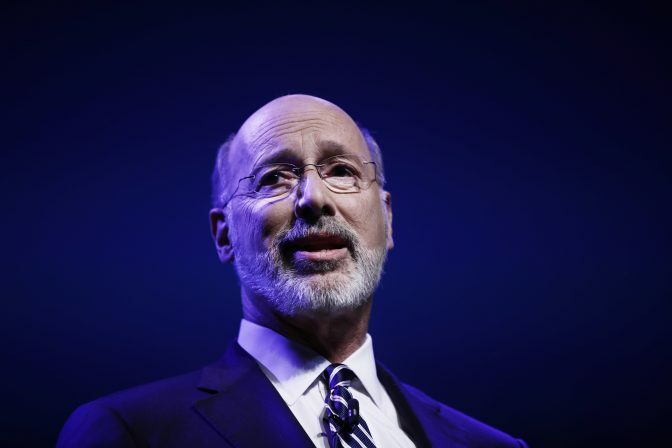 When I’m elected governor, if I don’t do anything in four years, I pledge to you that I will change my name to Tom Wolf. Trebek: Ladies and gentleman, on your behalf, I want to thank, I want to thank both candidates, and if I have managed to offend both sides, then I have probably succeed. And one final word, and that is, the answer, the correct answer to the very first question I asked here this evening is: Who is Chris Long? Thank you very much, Dennis. Let’s hear it for the candidates. Governor. Have I upset both of you? Moderator Alex Trebek speaks during a gubernatorial debate between Democratic Gov. Tom Wolf and Republican Scott Wagner in Hershey , Pa., Monday, Oct. 1, 2018. The debate is hosted by the Pennsylvania Chamber of Business and Industry.